Create personalized plates with your favorite photos. Choose from lots of layouts and backgrounds. 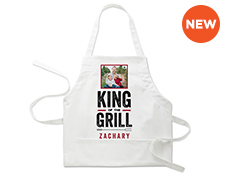 Give the chef in your life a personalized apron they're sure to love! Customize with favorite photos or sayings, it's sure to become a kitchen staple. 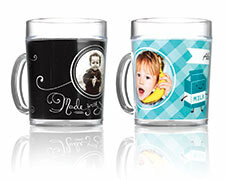 Create personalized cups with your favorite photos. Choose from lots of layouts and backgrounds. The most fun way to set the table. 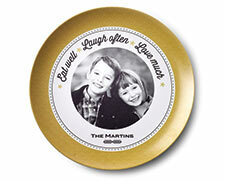 Personalized laminated placemats make a great addition to your tableware and are perfect for kids. 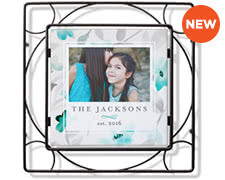 Personalize a custom trivet and bring your favorite photos to the kitchen. Perfect for every day use or as a memorable gift. Create a thoughtful gift or refresh a room with personalized scented glass jar candles. Choose from a variety of designs and scents. Sturdy and stylish, these clear trays are great in the kitchen, dining room or home office. 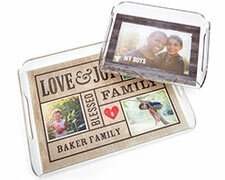 Personalize with photos, designs and more. 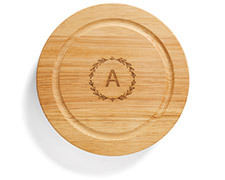 Add a personal message to create a custom cutting board that’s sure to impress. A beautiful way to store kitchen essentials or a collection of your favorite things. 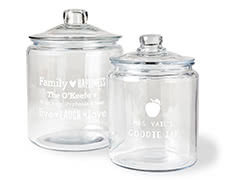 Personalized etched glass jars make a thoughtful addition to any space. 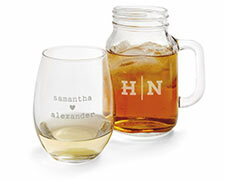 Make a charming gift or bring your own unique style to the table with personalized wine glasses and mason jars. 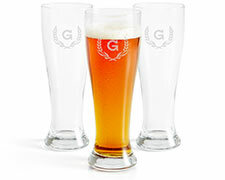 Make a toast in style with a personalized and stylish hand-sandblasted pilsner glass. Make a standout place setting with a personalized ornament. Choose from glass, metal, pewter, ceramic or wood cube ornaments. 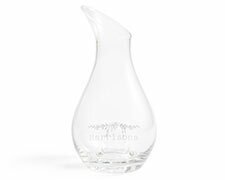 An elegant personalized hand-blown glass decanter, perfect for entertaining or gifting. 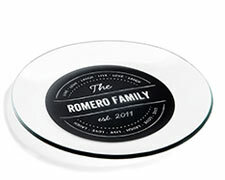 Set the table with glass plates that are clearly your style. Different personalization options make it easy to create a table setting that's eye-catching and welcoming for friends and family. As one of the most important rooms of the house, the kitchen is where family and friends gather to prepare meals for quality time together. 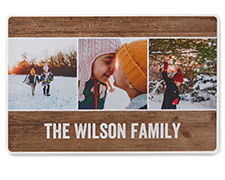 Whether you’re searching for the perfect kitchen gift for a foodie friend or want to surprise someone with a fun, useful and unique present, look no further than personalized kitchen gifts from Shutterfly. Give them a gift that keeps on giving, such as customized food prep items, mason jars and more. Don’t wait until the last minute to start checking off gifts for the holidays. Rest easy knowing you’ve created the perfect presents for family and friends that’ll leave them feeling warm and loved. Customize a variety of kitchen candle designs to create a space that radiates mood lighting and a feel-good atmosphere. After an evening cooking for the family, our scented candles are sure to keep their house smelling fresh. Choose from a selection of iconic, lovely scents such as Evergreen Forest, Fireside Spice, Grapefruit Blossom and more to capture the aroma of any season. If you’d like a gift they can use for years to come, discover our decanters for an elegant and sophisticated present. Not only are custom decanters great for entertaining, but they’re also the perfect gift for wine enthusiasts, liquor lovers, and home décor aficionados. Easily customize with your own personal statement or etch a family name, monogram, dates and more to make it truly theirs. Whether you’re welcoming a neighbor or attending a friend’s housewarming party, our personalized kitchen gifts make a thoughtful and unique addition to any new space. Instead of giving them a generic gift basket, why not add a little flair with a useful gift they’re sure to use every day? A collection of personalized jars will surely capture their attention. Glass jars are perfect for storing cookies, candy, pasta and more, but are also one of the most versatile gifts, providing the recipient with a chance to release their inner DIY artist. From candle holders to spice jars, planters to decorative lanterns, personalized glass jar can be a vessel for a variety of creative uses. For another adaptable gift option, custom mason jars bring a unique, authentic and rustic style to the dinner table. Mason jars are growing in popularity for their versatility and vintage look. They can be used to hold anything from drinks to salads to oatmeal or make chic decorative accents for any space. Give them a personalized housewarming gift that can be used during any meal of the day or for any craft project. Both dishwasher and microwave safe, is there anything a mason jar can’t do? 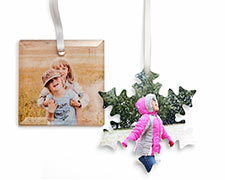 At Shutterfly, you’ll find hundreds of original, inventive and resourceful options for gifting. Our cups, serving trays, mugs and cutting boards are just a few additional ideas for inspiration. 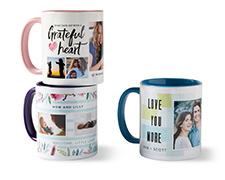 With all of our products, you can upload photos, choose from an assortment of layouts, backgrounds, colors and more to create custom, memorable gifts.